The home team can be selected in the left side text box, the visiting team in the right side one. The respective text boxes can be selected by mouse click or the TAB button. (Please note that the team names follow precisely the Bet365 specific names!) To find a certain team you can either start typing the team name or use the vertical scroll bar. Once the team names are selected, click on the [Red Ball] button. The fixture is moved to the bottom text box and the comparative statistics appear. The bottom text box holds all the selected fixtures -even if you leave the page and reload it later- until you intentionally delete the fixture by the [Dustbin] button. You can always revert to another fixture by selecting it and clicking on the [Blue Ball] button. Statistics of the selected fixture is presented in three tables. The first one contains data of the given fixture solely. The next table contains statistics of the home team and the last table of the away team and both tables can be sorted by selecting the Date/Home/Away column checkbox. The database contains statistics of more than 500,000 fixtures and gets updated every day. We strive for precision and completeness, however, humans are not perfect and the data amount is huge -the possibility of inaccuracy due to mistypes of misreports cannot be eliminated completely. Obviously, we cannot take responsibility for the fortuitous losses implied by that. In case of any questions, please do not hesitate to contact us by email at support@cornerstat.com. From 01.07.2018 more membership categories. 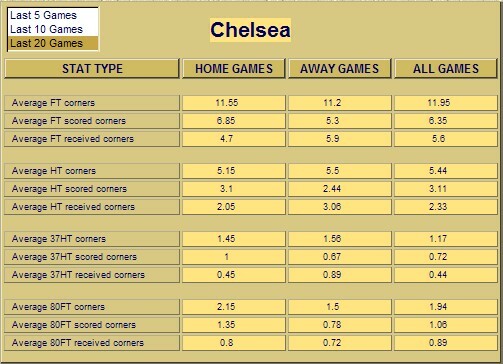 By this feature you can get the probable half time or full time corner result. Result Matrix is a summary table. It contains corner or goal results at a selected league. Please notify us if you find in the soccer corner statistics database a team with several names or other mistake. You can see the remaining time of session lifetime. Copyright © 2011-2018 cornerstat. All rights reserved.